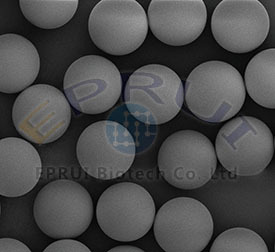 EPRUI Biotech develops a series of size controllable HPLC packing which is especially for the analysis and separation of carbohydrates including fruit juice containing organic acid, sugar alcohol, simple sugar, polysaccharide and so on. It is a kind of cationic exchange chromatography media which is prepared by sulfonating PS/DVB microspheres to make it hydrophilic following by chelating of various ions such as hydrogen(H+),calcium (Ca2+) and sodium (Na+). Ligand exchange is a preferred method for the chromatographic analysis and separation of many sugars and sugar alcohols due to the advantage of simply using water as eluent. In the process of ligand exchange, the negatively charged hydroxyl groups in carbohydrate molecules interact with the positively charged metal containing groups on the chromatography substrates. The carbohydrates are eluted by polar water mobile phase. 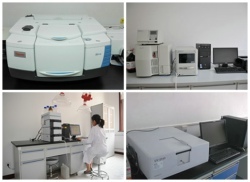 Due to precisely controlled particle size and extremely narrow particle size distribution, EPRUI is able to supply high performance sugar analysis resins which have high column efficiency, low back pressure, high resolution and good stability and reproducibility. The particle size can be selected from 5um, 10um, 15um, 20μm with cross-linking degree at 5%, 8%, or 10%. Please store around 4℃. Do not freeze. If don’t use for a long time, try to keep in 0.05% sodium salt aqueous dispersion.